Its creator wants the device to empower the black community. A hip-hop legend is asking people to trade in their iPhones and Galaxies for a new type of smartphone. One that runs on the blockchain. On Wednesday, artist/humanitarian Pras Michel launched Blacture — a platform designed to give “both voice and access” to the black community — during a keynote speech at the University of Pittsburgh. 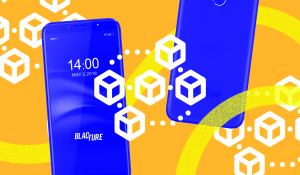 Blacture’s most unique initiative seems to be the Motif, the first blockchain-based smartphone intended for the U.S. market. The Motif doesn’t look all that different from your typical smartphone. But just like you learned in elementary school, it’s what on the inside that counts. And the Motif contains the Zippie operating system(OS). Created by blockchain and mobile tech company Zippie, this OS automatically rewards users with tokens whenever they use their Motif phones for activities like buying things online, agreeing to share their personal data (it’s not yet clear what data, or with whom), or making the exceedingly vague endeavor to “offer products and services” to the Blacture community. The tokens go into the Motif’s secure digital wallet. The user can then spend the tokens using a special Motif debit card, which works anywhere traditional debit cards work. No special bank account required. The Motif should be on the market this fall and will cost between $350 and $395. Even if mobile users don’t embrace the Motif, though, it may be the first of many blockchain smartphones to hit the U.S. market. And there are lots of other ways smartphones could embrace the blockchain. In September, developer Embedded Downloads began shipping its BitVault smartphones. The device, heralded as “the world’s first blockchain phone,” uses blockchain technology to amp up security, so it’s no surprise its target market is the defense sector. Military tech has reached the consumer market before, though, and the BitVault could conceivably follow suit. Meanwhile, electronics developer Sirin Labs already has a blockchain smartphone designed specifically for the consumer market: the Finney. That device specializes in making it easy for users to spend and store cryptocurrencies. It will be available for sale in a few nations, including Turkey and Vietnam, by October 2018. Sirin CEO Moshe Hogeg told Bloomberg the company thinks it could ship upwards of 3 million Finneys in 2018. If demand is as high as Sirin hopes, other blockchain-based smartphones like the Motif might soon compete with iPhones and Galaxies in the U.S. market.